QUESTION: Mr. Armstrong, I am just getting started in studying cycles. Someone said you just bumped into the Kondratieff Wave. Your works seems entirely different. Did the K-Wave have any influence on you? ANSWER: Sadly, the Kondratieff wave, commonly known as the K-Wave, is used for things it was not based upon. Moreover, there were cyclical theories that were emerging a generation before Kondratieff. 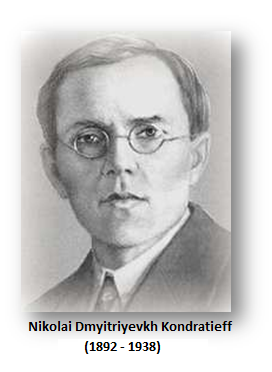 He became the most famous theorist because he was executed for his theory. 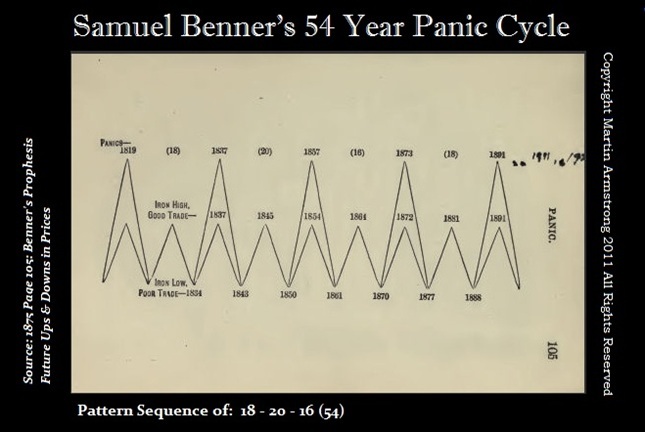 Here is a chart of the business cycle that was created by a farmer named Samuel Benner. 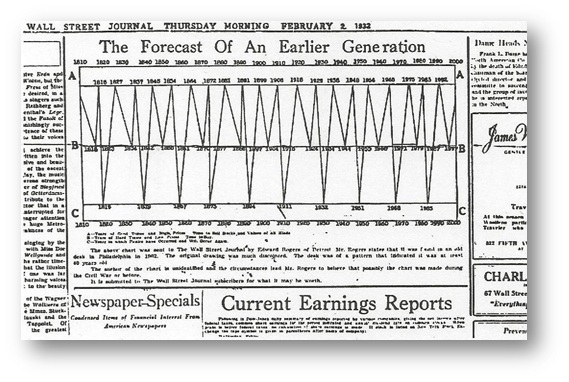 When the Wall Street Journal published this cycle in 1932, nobody knew who had investigated this phenomenon. Nonetheless, both Benner and Kondratieff made their calculations based upon an economy that was commodity driven. 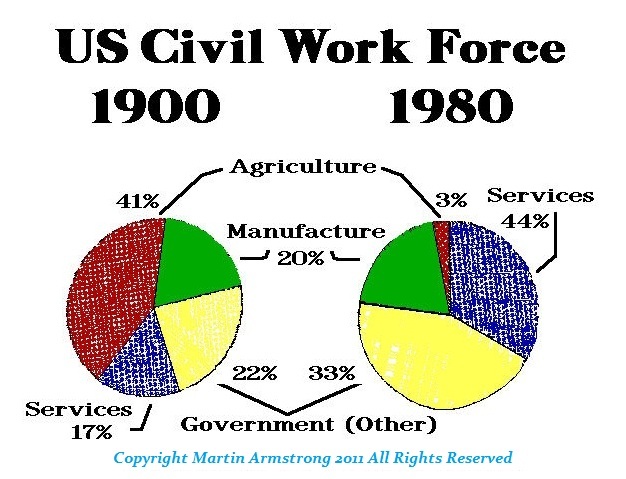 In the 1850s, about 70% of all employment was in the agriculture sector. Therefore, if you created a model at that time based upon commodity prices, you would have been largely correct. However, taking the K-Wave and Benner’s work forward fails to provide a guide to the modern economy. Why? The economy is not stagnant. It grows and evolves with innovation (technology). This was what Schumpeter noticed and his theory explained the cyclical nature of the business cycle through waves of innovation. The combustion engine caused unemployment in the Great Depression; nobody realized it was because a tractor displaced 100 workers. Today, technology is advancing and the internet has wiped out book publishers and will wipe out the mainstream media. The internet is also wiping out local stores who cannot compete with online prices. Then add the development of robots. Obama and Hillary want to raise the minimum wage to $15 and mandate equal pay for women. However, this would merely create an incentive to replace workers with robots. Due to pension costs, companies are shifting toward part-time workers to avoid those drastic expenses. This is all part of the innovation cycle in technology. It is the very reason the design of the Economic Confidence Model (ECM) is entirely different. The mistakes of both Kondratieff and Benner were understandable. If you wanted to monitor the economy today, you would look at the service industry that generally accounts for 70% of all employment (stores, banks, brokers, and even government). We must recognize this flaw in attempting to create any type of business cycle model. This is why the Economic Confidence Model is not based upon Benner or Kondratieff, for that would not provide a modern, accurate indicator since commodities are no longer the primary mover in the economy. It would also fail to recognize that there is a cycle to technology or innovation. The ECM works ONLY because it was based upon the total economic environment and back-tested into ancient times. So it is very different. The K-Wave still works for the commodity sector, just not the entire economy. The theory of the business cycle, nonetheless, still prevails.